Here at Aford Awards we offer an extensive collection of top quality, value for money fishing trophies, medals and plaques suitable for any fishing event or competition. We’ve been supplying fishing trophies and medals to clubs and tournament organisers for over 30 years, during which time we’ve firmly established a reputation as one of the UK’s leading fishing trophy suppliers and engravers. We pride ourselves on the exceptional quality of our products, as well as our unrivalled customer service. We constantly monitor our prices to ensure you always get the best possible deal. So browse our range of first class fishing trophies and we guarantee you’ll find the one for you! Whether you’re looking for a fisherman of the year award, a junior fishing trophy, a trophy for your top angler or a presentation cup for the winner of your fly fishing tournament, our online trophy store has everything you need to make your event a truly memorable occasion. As well as our wide range of classic resin fishing trophies, we also offer a variety of crystal fishing trophies that will add that extra touch of class to your awards ceremonies. We want to make sure your fishing trophy or medal looks great for many years to come – which is why each one is made from the highest quality materials. All our fishing trophies come with a complimentary fishing-themed centre, but we can also personalise them as an additional option if required. Our team here at Aford Awards also make it our mission to give you the best prices you can find online. If can show us an identical fishing trophy that is available at a lower price we’ll beat it by 5%. To find out more on how we guarantee our customers the cheapest trophies anywhere online, please read our Price Promise page. 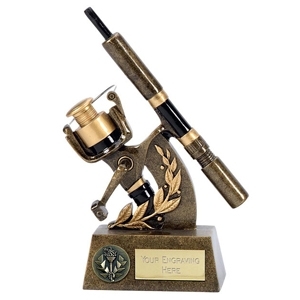 We offer free engraving/personalisation on all our fishing trophies, cups, medals and crystal awards. Free logo engraving and text is also available on all our range of silver and nickel-plated cups. If you need a different item personalised, such as a watch, a piece of jewellery or tableware, take a look at our premium engraving service. We can also personalise trophies you might have purchased elsewhere. If you have any questions about our products or services, please feel free to get in touch – we will be happy to help. Alternatively, if you’re looking for trophies or medals for another sport, check out our Sports Trophies page, where you'll find everything from golf trophies to swimming trophies.